​Keep an eye on your email inbox for your confirmation email - be sure to click the confirmation button so you don't miss any of our essential oil info! A Dose of Aromatic Wisdom comes to you free every month. Taking the Aromatherapy Certification Program at the Aromatic Wisdom Institute was one of the best things I’ve done for both my personal and professional development. 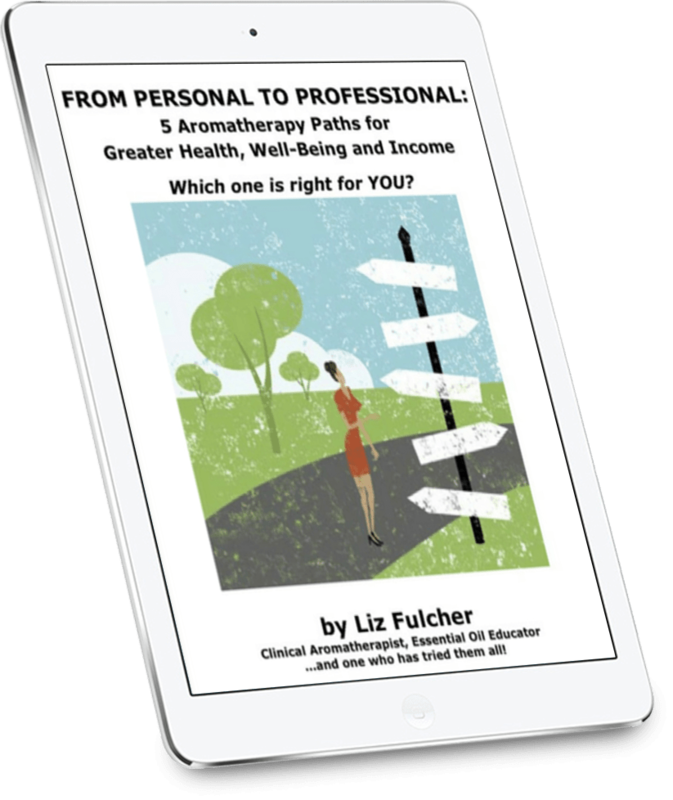 Liz Fulcher is a caring and knowledgeable instructor who made it easy and enjoyable to learn the chemistry of many of the oils I was already using. She supports her students before and after the course, and the boost in business I’ve received from her networking skills and mentoring in social media are well worth the investment I made in becoming certified. I love being able to tell clients that I’m a certified aromatherapist and seeing the difference that makes in how they relate to me and my products! The Aromatherapy Certification Program with Liz at Aromatic Wisdom Institute surpassed my expectations. I entered the program uncertain on the proper use of essential oils and walked away with a knowledge base that I am using every day in my massage therapy practice. The ACP course has given me the confidence to make recommendations to my clients that are within proper usage and safety guidelines. The 235 hours program was time well spent as I now have a thorough knowledge of use, dilution, and therapeutic properties of the essential oils studied. Liz had everything on hand that we needed including an amazing handbook that I continue to reference every day. We were able to blend with dozens of oils and use accessories that I would not have had access to on my own. I have taken a variety of continuing education courses but found that when I study with others in a classroom and in a hands-on setting, I am more apt to retain and use the information learned. I gained valuable insights from fellow students and Liz was very generous in sharing what I like to call “Liz wisdom”. Liz brings a wealth of knowledge (and tons of fun) to the classroom from her 23+ years as an aromatherapist. This kind of learning cannot be duplicated from an online class! My recent completion of the ACP Training at the Aromatic Wisdom Institute was a life changing experience! The incredible knowledge gained on the chemistry of the oils and personal blending with the oils, helped me get a better understanding of how to properly and safely use essential oils for their many therapeutic properties. I now have complete confidence on how to handle, blend, and use essential oils to help myself and others. One of the best parts of this course was being in a live classroom with Liz Fulcher. I had considered doing an online course but after much thought I knew that I wanted and needed “hands-on” training. We experienced, experimented, and made products with about 48 different essential oils. In In class, we asked a lot of questions, were able to bounce ideas off of Liz and each other plus, and had a lot of fun! I’m so glad I made the choice to attend this live ACP training with Liz. I took the Aromatherapy Certification Program with Liz Fulcher in 2012. After researching Aromatherapy classes for a few years, I decided the only way to go was in person so I could smell, feel and see the differences in the essential oils. This decision I feel was the absolute best thing I have done. There isn’t a day that goes by that I don’t pull out an essential oil to use in my daily massage practice. From clients with pain, headache, muscle spasm, gas, etc. I am able to blend a quick remedy and they are loving the benefit! Liz knows the oils so well and is an amazing teacher. I cannot imagine finding a better teacher. Thank you Liz! AWP 037: Essential Oil Sensitization: Are You at Risk?